Buckminster Fuller, the famous architect, coined the phrase "Form follows function". We improved on this by combining the best of form and function by using versatile vinyl in the construction of our beautiful porch railings. Our stair railings are specially manufactured for easy installation. 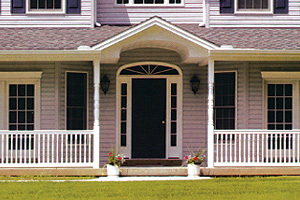 Built for both safety and strength, they exceed all building codes. 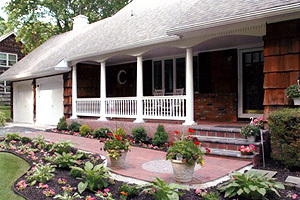 Our trained staff can instruct you on how to install porch and stair railings yourself! 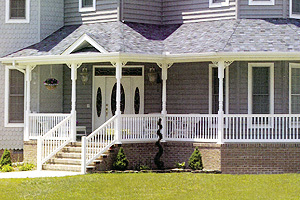 Accenting your porch railing with posts adds beauty to any installation. With many different styles to chose from, you can frame your home to have a Victorian, Country, Contemporary or Hampton feel. Our number is (631) 265-3577 – we look forward to hearing from you!